Kick boxing trousers and full contact trousers for a foolproof performance during your workouts and boxing matches. 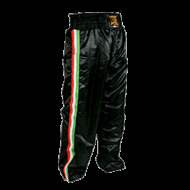 You will find a nice range of kickboxing pants on our boxing store Strasbourg BARBARIANS FIGHT WEAR. These pants from the famous Italian brand Leone 1947 have been specially designed for those of you who participate in different kickboxing disciplines. They are made from breathable materials and very comfortable and lightweight. The kick boxing pants will perfectly follow your kick techniques without any embarrassment. It will provide great freedom of movement and allow the fighter to wear comfortably as well during an intense training as during a kickboxing fight or full contact. 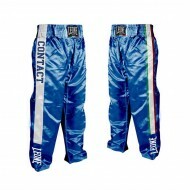 Our kick boxing clothes are recommended for kickboxing, full contact and for those who get into the ring. The fit of our kick boxing pants is just fantastic. 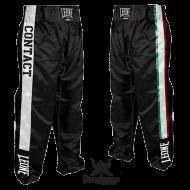 The full contact and kickboxing pants are specially designed for kickboxing, full contact design and for a variety of martial arts with modern designs. The Italian flag on the left side of the pants will seduce the Italians for sure. Ideal "also to come and go in your boxing gym. Our full contact trousers are available in blue and black and in large sizes (from S to XL) to meet the needs of men, women and children. Indeed our women's full contact trousers are perfect for experienced boxers! No matter if you are a very experienced fighter or an amateur or recreational boxer, we have the ideal kickboxing equipment and clothing. You will inevitably find a product you will like among our wide selection of products from Leone 1947. You can rest assured of the unbeatable value and exceptional quality of each product in our BARBARIANS FIGHT WEAR online store.